Ideology studies have undergone significant growth over the past couple of decades. The scope of the discipline has been extensively broadened to include not only text and discourse but emotions, imagination, fantasy, rhetoric and visual forms. Its attention to detail and to the micro-manifestations of ideology in the everyday have borne considerable fruit, particularly at a time of ideological fragmentation and reassembly. Its research methods have been refined, embracing both conceptual innovation and empirical evidence drawn from many fields of social creativity. During that period, the Journal of Political Ideologies has been a major vehicle of the discipline’s advance and coming of age. The chapters in this book originally published as two special issues in the Journal. 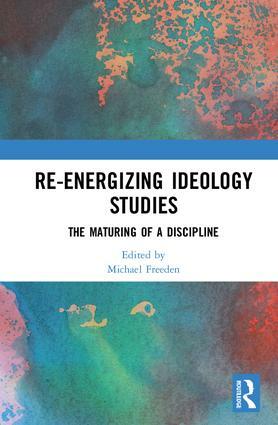 The book assembles and investigates some of the latest approaches and domains in which cutting-edge ideology-research is now under way. The multiple topics, sources and interdisciplinary perspectives it contains illustrate the variety and depth that ideology studies have attained. Its subjects range from historical and literary analyses, through feminist studies, and psycho-social interpretations. It takes in the new means of dissemination that the digital age has introduced, and offers fresh assessments of the many cross-fertilizations possible between ideology research, political theory, and international studies, as traditional ideologies vie with new ideological articulations and forms. 10. Ideology, socialism and the everyday: forgotten lessons from the inter-war years? Michael Freeden is Emeritus Professor of Politics, University of Oxford, UK. His various books investigate liberalism, ideology, and the nature of political thinking, and he is the founder-editor of the Journal of Political Ideologies. He has been awarded the Sir Isaiah Berlin Prize for Lifetime Contribution to Political Studies by the UK Political Studies Association, and the Medal for Science, Institute of Advanced Studies, Bologna University.